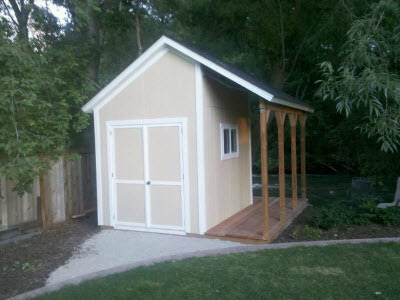 What would be your ideal shed location? For some people it would be next to a beautiful beach. 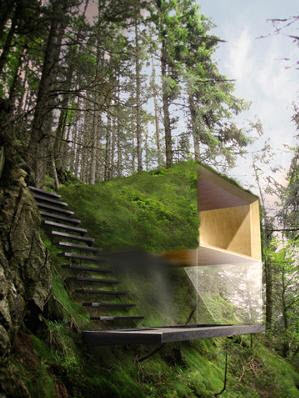 Others would prefer to have a mountain cabin with crystal clear air and beautiful views. For John Liehe it was at the bottom of his garden, located in Northern Utah, USA. The unusual thing about John's garden is that it has a beautiful trout stream running past the bottom of it. John's design has a fairly traditional (on the outside) gable roof design but he has inset the walls on two sides to make the most of the view over the garden (and that trout stream at the back). 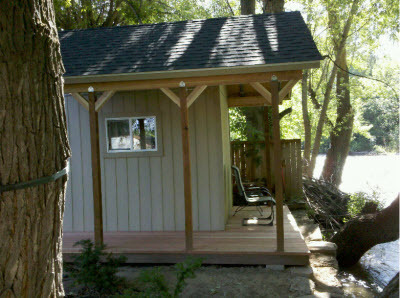 The inset walls allowed the construction of a redwood deck to the side and rear of the shed. This design means that the shed combines the functionality of storage as well as providing outside shelter for fishing and enjoying the occasional evening cocktail whilst admiring the beauty of the surroundings. 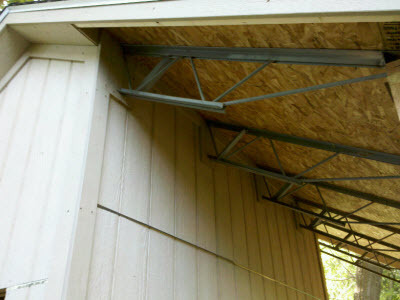 The materials for the shed roof are the most unusual part of this project. John works for a steel supplier and saw that there were a number of steel 'lattice joists' in the scrap bin. Rather than let them go to waste he re-purposed them by welding them into an 'inverted V' shape and used them to form the roof. a fairly traditional looking timber stud wall, while the other is supported on a series of four posts along the deck side. The rest of the shed is of a fairly traditional construction with a timber floor and timber stud walls. Despite all of this there were a few tricky details to think through. Without a construction buddy to talk things through with John told me that he found himself 'over-thinking' a lot of the details. In particular overcoming the tricky detail of designing around the joist tails at the eaves of the building was a particular problem that required a lot of thought. A good section of this was the ground works. There was a large earth 'berm' on the site of the shed that needed to be removed to form a flat site. Ground works to form the shed base is an area that is often overlooked in many shed projects and can take a big chunk of the project time. I had a report the other day that John had caught a couple of brown trout from an area just behind the shed. How about that for an ideal location? Comments for What would be your ideal shed location? Great looking shed. What will happen when the stream rises and washes it away? Nature has a way of giving you a good swift kick in the rear when buildings of this sort are put in the "ideal" place. Enjoy it while you can. Nature always has the last laugh. Hi thanks for joining in. I shared your concern about the river rising and washing the shed away. I was a bit concerned when I heard that a berm had been removed, but John (the shed owner) confirmed that there is a retaining wall that we can't see that protects the embankment and the shed is in fact quite well protected. I have another couple of examples here of sheds that could be in ideal locations. The first one from one of our shed competition looks spectacular and probably couldn't be built. The second was built in 1922 and was the highest structure in North America at the time. Although it is no longer the highest, it is still very much in use today. Love the Abbott Pass Hut - would be awesome to go there one day! 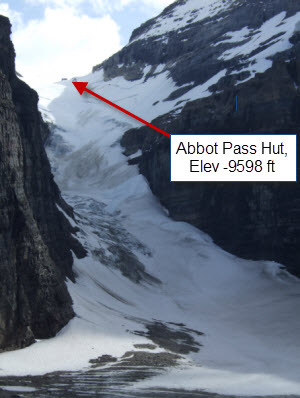 It's best to climb up there from the other side (Lake O'Hara) as the icefall this side is known as Death Gulch. It is the place where the first known mountaineering fatality in North America occurred. Apparently there is a steady stream of rock and ice debris falling down there, despite how beautiful it looks. Let's do that hike on our next trip! Very nice shed ! I too am experiencing working alone building a lean to along side my house and over my drive. Propping timber apex ledgers up with 2" x 2" did solve some issues. But certainly being on your own I do over think things, worry far too much about vents etc and over engineer joints. I did have some concerns about the river rising, This was actually a record year for the amount of snow pack, but the 100 year flood marker was still below the elevation of the shed, and the water level never really got close enough for concern. 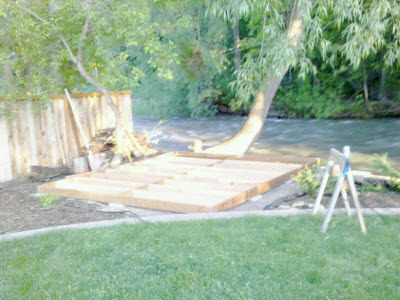 If the river ever does flood bad enough to wash the shed away, the shed will be the least of my concerns. 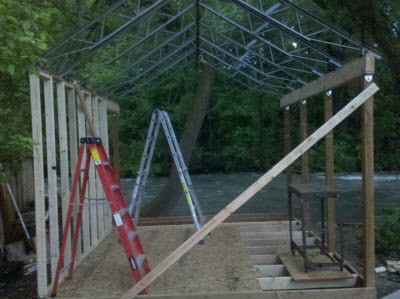 I did have some help setting the joist and lifting the walls, but most of the work was on my own. Like John mentioned, the worst part was not having someone around to bounce ideas off of. Most of the work was pretty easy in the end, but there was definitely too much time standing there staring at it trying to think how to solve a problem. Some advice: when you do your material take-off, make sure you buy a few extra of everything, The cost of the extra material is worth the time saved by going back to the lumber store when you cut something wrong. (If you are like me, it happens often. 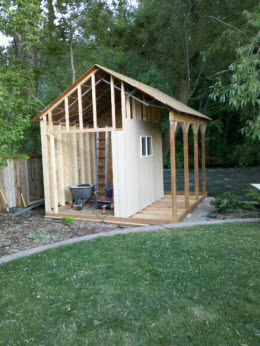 )Good luck on your own shed, it is very rewarding building it yourself.